Looking for the fastest way to sell a vacant house in Charleston, SC? 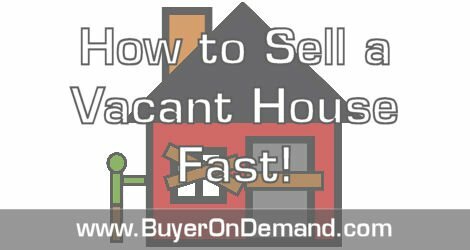 Below are a few things to consider beforehand to help sell a vacant house fast and why you should. In the perfect world scenario, the day you put your house up for sale the first person who looks at it buys it and you sell it in less than a week, but is not always the case. Your home may sell before you find a new place to live, or you may find that new home before your old one sells. There are many reasons why a house becomes vacant while an owner is trying to sell. In these situations, it is important that you try to get that vacant house sold fast, but many circumstances can prevent a quick sale. Below are a 4 of the most common reasons houses becomes vacant. The seller has already moved out. Relocating is a common reason to have a vacant property to sell as well. Moving to another city while your house is still not sold can become stressful, to say the least. New construction. You may not have thought of this one but like a car sitting on a car dealership’s lot waiting for a buyer. Much like that car, any newly built house will have time on the market without an owner or resident. Inherited Property. A family member passes and you inherit the property. This can be especially difficult if the property is out of your area or it’s in an area you don’t want to live. If you know you have a possibility that you might have to sell your house while it’s vacant, try harder to sell it! There are many reasons why selling your house before it becomes vacant is important. Vacant homes are always subject to vandalism and theft, trespassing or squatting, weather, neglecting regular maintenance, all of those things can become costly over time. Not only will turning your utilities off in an empty home speed up weather damage that will result in costly repairs, it will also give a potential buyer the impression that the house needs more repairs than it actually does. Keeping utilities on will also make it more comfortable for anyone seeing the house and well as deter potential thieves and/or trespassers. If you are selling a vacant property, the costs involved can get overwhelming. The best way to avoid any of these costly situations of owning a vacant property for sale is to sell it fast. The quickest way to sell a vacant property is to sell to a local real estate investor like Charleston Property Solutions. We buy vacant homes, repair them and resell them, in other words, we take all the risks of selling a vacant property and you can move on. So even if the house has experienced damage from weather or vandals, it can still be sold as-is. We offer free no-obligation quotes, we can pay cash and close quickly. If you want to sell a vacant house in the Charleston area, call us today to see how we can help at (843) 478-7206 or complete our home seller questionnaire for a fast cash offer for your vacant house!